We have some news! An important announcement may be imminent. The Canadian government may announce a human rights ombudsperson as soon as next week. A human rights ombudsperson is essential to ensure that people who have been harmed by Canadian mining, oil and gas companies overseas can have their cases heard in Canada. Amnesty International has been calling for the creation of a human rights ombudsperson for years. Thanks to you and over 100,000 other concerned Canadians who signed petitions and postcards, we are closer now than ever before. We have nearly convinced the government that Canada needs an ombudsperson. The final sticking point relates to the ombudsperson's investigatory powers. An ombudsperson needs to be able to review all the information related to a case in order to issue findings and recommendations. Unfortunately however, industry is pressuring the Canadian government to create a weak ombudsperson without effective investigatory powers. This will severely impair the ombudsperson’s ability to review evidence and make findings and recommendations. Help us convey to the government that strong investigatory powers are essential for the ombudsperson’s office to be effective. The government is considering this important issue right now. It is critical that the government hears from you immediately. Please tell Canada’s Minister of International Trade that you support a human rights ombudsperson with strong investigatory powers. Petitions are important and powerful tools for justice. But individual letters can have an even greater impact on governments. The extra effort involved in delivering your own message demonstrates a level of awareness and concern that matters to governments – especially when they are concerned about their own re-election prospects. Please write a short, courteous letter to Canada’s Minister of International Trade. emphasizing that in order to be effective, an ombudsperson must be able to conduct effective investigations. You are encouraged to draw on the arguments below for your letters. People who have been harmed by Canadian mining, oil and gas companies overseas should have an opportunity to seek justice in Canada. During the 2015 election, the Liberal government committed to creating an independent ombudsperson office that would consider complaints made against Canadian companies operating overseas and investigate those complaints. You expect the government to fulfil this commitment! In order to be effective, an ombudsperson must be able to review all the evidence. But it is unlikely that companies will voluntarily hand over incriminating evidence. Therefore, the ombudsperson needs the power to compel documents. 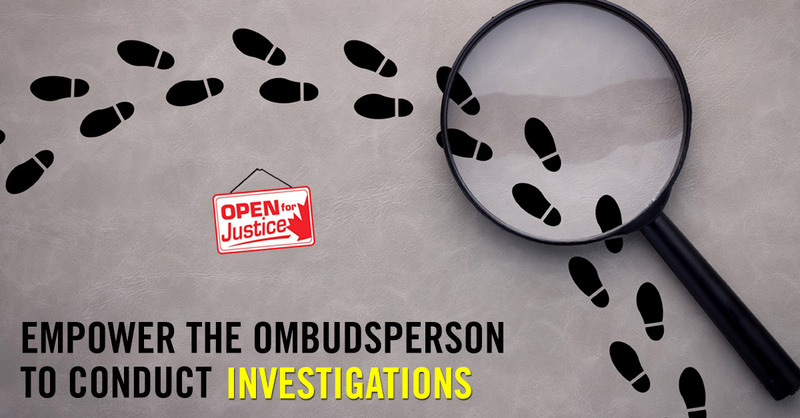 If the ombudsperson is not given this power, he or she will not be able to conduct effective investigations, or make findings and recommendations. Creating an ombudsperson with robust investigatory powers will demonstrate Canada’s global leadership and serve as an example for other countries. Minister Champagne we understand that you are ready to announce an ombudsperson that is best in class, that fulfills Canada's international human rights obligations and that shows leadership in business and human rights around the globe. Creation of an effective ombudsperson will do so much to help improve Canada's tarnished image and we are looking forward to loudly applauding your announcement. In order for the ombudsperson office to be effective it needs to be given both the mandate and the tools to do the job. It is of utmost importance that the ombudsperson be able to get the required information so that s/he can conduct an effective investigation. Without powers to compel documents, the ombudsperson doesn't have “teeth”. To be credible, the ombudsperson office -- and the entire investigation process -- must be independent. I look forward to hearing about how you have included these essential elements -- effective investigation and independence -- in your upcoming announcement. In addition to writing to the Minister, please cc your letter - or write separate letters - to the Minister of Natural Resources and your Member of Parliament (contact information provided below).